You must try our Greek Yogurt Cheesecake! 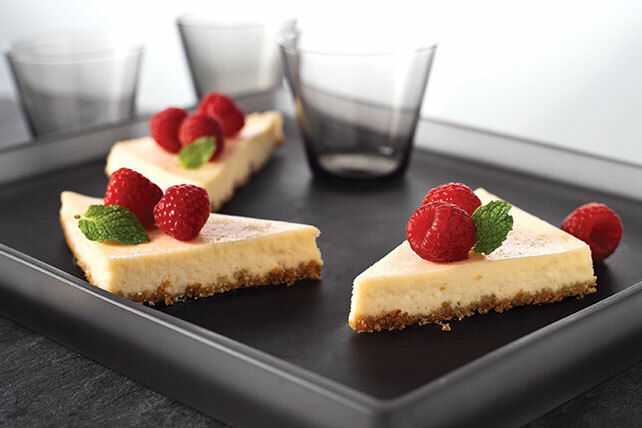 Neufchatel cheese and Greek-style yogurt give this luscious vanilla cheesecake its rich and creamy texture. Sprinkle crumbs onto bottom of 13x9-inch dish sprayed with cooking spray. Beat Neufchatel, sugar and vanilla in large bowl with mixer until well blended. Add yogurt; mix well. Gradually beat in whole eggs and egg whites, mixing after each just until blended; pour into prepared pan. Bake 55 min. to 1 hour or until center is almost set. Cool completely. Refrigerate 4 hours. We replaced the 4 (8-oz.) pkg. of PHILADELPHIA Cream Cheese in the original recipe with 2 (8-oz.) pkg. PHILADELPHIA Neufchatel Cheese and 1 (16-oz) container plain nonfat Greek-style yogurt to save you 110 calories and 13 g of fat, including 8 g sat fat, per serving. Substitute 1/4 tsp. almond extract for the 1 tsp. vanilla. Garnish with fresh raspberries, strawberries, blueberries and/or fresh mint just before serving.